New studies show how satellite images can predict the spread of human illness. (Inside Science) -- Satellite images are great for creating maps, finding bad guys, and, it turns out, predicting when deadly illnesses may break out. By watching colors change on photographs of the Earth's surface, scientists can figure out, months or even years ahead of time, when a disease might flare up and become a serious hazard. Traditional methods for following the spread of disease are hard work, according to biologist Denise Dearing of the University of Utah in Salt Lake City. She studies hantavirus, an untreatable rodent-borne virus that has infected more than 560 people in the United States since it was discovered in 1993. It's fatal in about half the cases. To keep tabs on the disease, "we had been going out and surveying mouse populations," Dearing said. But catching the mice, testing their blood, and microchipping them for future reference was difficult and time-consuming. In 2004, Dearing's team of biologists began working with geographers on a high-tech way to track mice. The researchers studied numerous satellite images of their test area in central Utah to understand variations in the amount of vegetation covering the Earth's surface. After a rainy winter, more greenery popped up -- creating more food for the mice and causing the critter population to increase. And more mice meant more carriers of hantavirus coming into contact with humans. Their study, published last week in the journal Global Ecology and Biogeography, combined satellite imagery with data from thousands of mice captured over three years. The scientists found that a rise in vegetation led to a potentially illness-causing spike in the mouse population about 12 to 16 months later. The power to predict disease outbreaks could be tremendously useful, said Tim Ford, a microbiologist at the University of New England in Biddeford, Maine, who studies water-borne illnesses. "Satellite prediction is a very exciting approach, though it still needs more refinement," Ford said, adding that any information from the sky must always be double-checked against conditions on the ground. Ford has examined other diseases whose spread might be predicted from satellite images. For malaria, public health officials could examine the amount and location of standing water where disease-carrying mosquitoes reproduce. For cholera, they could look at sea surface height and levels of the green pigment chlorophyll, because cholera bacteria spend much of their life attached to a floating animal that feeds on chlorophyll-filled plants. Ford said there is even evidence that the spread of avian flu could be predicted from remote imaging, by mapping rice paddies and bird migration routes to identify potential hotspots for the disease. Advance warning of an outbreak can be a matter of life and death. Ford's research shows that if health officials know that a cholera outbreak might be coming, they can encourage people to take simple precautions like filtering drinking water through a cloth, which can reduce mortality by 50 percent. In the case of hantavirus, people in areas where mouse populations spiked in 2005 and 2006 were warned to avoid sweeping out barns -- the virus typically infects humans when they breathe in tiny particles that spread into the air from mouse droppings. Still, there are challenges to making sense of all the images from above. "Some of the limitations are problems like cloud coverage changes over time [and] spatial and temporal resolutions," as well as insufficient understanding of the relationship between habitats and the animals that carry disease, said Xiangming Xiao, a professor in the Center for Spatial Analysis at the University of Oklahoma in Norman. Xiao has started testing the feasibility of tracking avian flu from satellites. Remote tracking of disease will likely grow in the coming years, as images get sharper and data analysis gets more sophisticated. 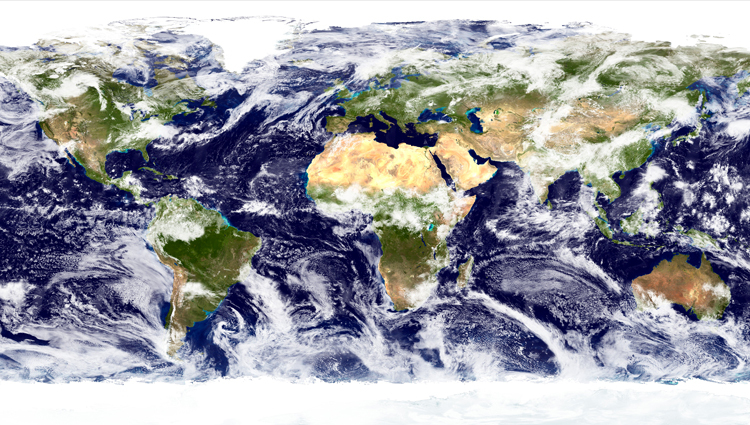 "Satellite images will continue to play an increasing role in disease ecology and forecasting," said Xiao.